Image of Jason Holder courtesy of Graham Fischer. Apart from a four year stint in Queensland, Stubby has been a fixture in Adelaide for most of his career, picking up 5 jockey’s titles along the way. We should explain the derivation of the popular nickname “Stubby”, right from the top. It was bestowed upon him by trainer Jon O’Connor, and was a natural for a bloke with the surname of Holder. As rare as a blue diamond are those in racing who don’t call him “Stubby”. Young Holder had two uncles on his Mother’s side, who dabbled in horse training at Mount Gambier, and that’s the extent of the genetic factor. However his Mum Sue loved the races, and often took young Jason to the track. From the very first time, he was mesmerized by the sleek thoroughbreds and the jockeys in their sparkling rainbow jackets. He was still at school when he started weekend work experience at the stables of leading trainer Leon McDonald, and he followed up with a TAFE course in horse management. Jason was thrilled when Leon McDonald agreed to indenture him, and the journey began for the little bloke with a head full of dreams. Apprentices were required to complete ten trial rides, and young Holder was champing at the bit. “I thought I made a big impression winning nine of those ten trials, and I was pretty sure my magic touch had something to do with it”, said Jason this week. “When I went out on Personator for my first race ride at Port Augusta in 1991, I just expected him to win. I was shocked when he ran only third in a 5 horse field. By the time I rode my first winner four months later, I’d worked out the difference between barrier trials and races. We ride at catchweights in the trials, meaning my mounts were carrying around 36kgs. No wonder they flew”. For the record, J. Holder’s first winning ride was on the MCDonald trained Our Boy Peter, in a 1700 metre Maiden at Clare in December 1991. That magical first city win means the world to any junior rider. Jason Holder couldn’t have scripted it better, winning his first “metro” on Adelaide Cup day 1992. He won a 3yo+ sprint on Spirit Of Icarus for Leon McDonald, while the ever popular Subzero completed the SA Derby/Adelaide Cup double with Greg Hall up. “Stubby” had to wait 4 years to win his first hometown Cup. Astute Victorian trainer Colin Alderson was looking for a competent local lightweight rider for a mare called French Resort in the Gr 3 West End Draught, and the Group 1 Adelaide Cup. Holder was the lucky local rider, and he snared the double for the likeable Victorian trainer. In 1994 Jason scored a surprise win in the Gr 1 Goodwood Hcp, on the Barry Brook trained mare Ambala who, at huge odds nosed out the well fancied Simonstad. Such is the significance of the Melbourne Cup to Aussie jockeys, to even run a place is almost as good as a win. “Stubby” got to ride Skybeau in one of his 5 Melbourne Cup appearances, and was thrilled to finish third behind Saintly and Count Chivas in 1996. 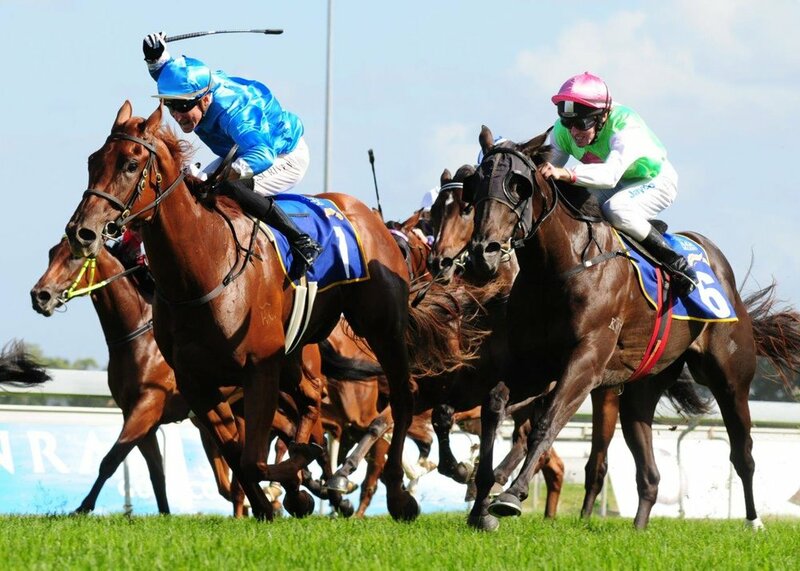 “I looked like running 5th at the 200 metres when he got on one rein, and started laying in. Somehow he got going again to grab third, and i was thrilled beyond belief” recalled Jason. He got to ride the very talented Gold Guru on three occasions in the gelding’s 2 year old campaign, winning the Gr2 Breeder’s Stakes in 1997. Jason also won 4 races on the dual Gr 1 winner Umrum for Leon McDonald. The gelding won the Toorak Hcp twice, and was placed in several other Gr 1 races. Jason rode him as a 2YO, for consecutive wins in the Listed Sunsmart Stakes and Gr 3 Sires Produce Stakes, but didn’t ride him again for a long time. Leon McDonald shipped the horse to Tasmania for two listed races in 2003, and invited Jason to renew his association with the veteran. Umrum won both races comfortably, at prohibitive odds. Jason was always keen to win his local Derby, and achieved that distinction in 1997, when he rode the Cliff Brown trained Markham to a comfortable win in the classic. A few months later he was delighted to have his first Caulfield Cup ride on Markham, finishing a respectable 4th to the “rampaging” Might And Power. Mick Dittman replaced Jason in the Melbourne Cup, finishing third behind Might And Power and Doriemus. “That’s the way it is in racing”, said Jason.”No point getting sour on losing a ride. I’ll always be grateful to have won a Derby on Markham”. About ten years ago, Jason decided on a dramatic change of direction that should have been a life building experience, but ended in disaster. He relocated to Queensland, and quickly gained recognition from local trainers. He rode work at the coast mainly for Kelly Doughty, but most Saturdays could be found at Doomben and Eagle Farm. The late Bruce McLachlan gave Jason tremendous support during the jockey’s four year stint, and was a major player in helping him to premiership victories at Ipswich and the Sunshine Coast. When Phelan Ready burst onto the scene in early 2009, Jason Holder was McLachlan’s choice to pilot the son of More Than Ready in three races. He ran 3rd first up in the Meynink Stakes, followed by a fourth in the TJ Smith Slipper, and those two runs brought him on in leaps and bounds for the Magic Millions Classic, but punters were not aware of that improvement. He started at $51.00, and even that looked under the odds as he turned for home in front of only 3 or 4 horses. He gave the leaders 5 lengths as Holder got him to the outside at the 200 metres, and he looked more like a $2.60 chance as he hurtled home to beat Motown lady and Paprika. Jason was still on a high a full week later when he rode Oscar The Great in the Te Rapa Hcp at Eagle Farm. He clipped the heels of another runner when racing tight in the homestraight, and his mount crashed to the turf. Jason looked in bad shape as he was loaded into the ambulance, and actually suffered a ‘seizure” on his way to hospital. His rapid recovery was testimony to the skills of the ambulance crew, and hospital medical staff. It’s not hard to imagine Jason’s feelings, when Phelan Ready came out to win the Golden Slipper with Brad Rawiller on board. ‘I was booked to ride him in the Slipper immediately after the Magic Millions’, reflected Holder. “Of course it was hard to take, but Brad Rawiller eased the pain a little when he gave me a special mention in his acceptance speech”. Friends and family were stunned, when the plucky South Aussie returned to race riding in just four months, with a fierce resolve to get back to the top. He got the travel bug this time around, and refused to sit still. He honoured a 4 month retainer in Mauritius where he rode several winners, followed by another 4 months in Singapore where the winners continued to flow. Then came 3 months in Hong Kong followed by a full year in Macau where he won 48races. With the overseas fad out of his system, Jason headed home to Adelaide, and put his nose down and tail up. He got another premiership under his belt in 2015/16, and is currently committed to holding his spot among Adelaide’s top jockeys for the remainder of his career. Golf is traditionally the favourite diversion for jockeys, but Jason Holder has found one that takes him into another world. He owns two magnificent Siberian huskies, and competes with them regularly at Mount Crawford Forest in the North Adelaide Hills. He’s one of 60 members of a Husky Club, and they run well organised “race meets” in a breathtaking environment. Jason’s dogs Alaska and Mia compete in the ‘scooter category, and are highly competitive. The jockey’s seventeen year old daughter Paris is even keener than her Dad, and can’t get to Mount Crawford quickly enough on Sundays. Jason is in a very good place at the moment. He has Paris and his partner Caitlin holding the ship steady, and he enjoys the support of several loyal trainers. With an impressive career tally of 1800 winners,’Stubby” can look forward to reaching the 2000 milestone in a couple of seasons. He said something to me on the phone last week, that exemplifies his slant on the life of a professional jockey. His words were “the next winner is far more important than the last”.